Monday, musician Gerald Dowd, touring with the musical The Mysterious Hat (which played at the New Victory Theater last weekend), taught the kids about rhythm and drumming. We gathered instruments from far and wide to shake, rattle and drum so the children could identify and connect with their own internal drumbeat. There was the perfect mix of experimentation, playing to familiar songs and lots of freestyle rhythm. Gerald was very generous of heart; we all felt very lucky to host him here. 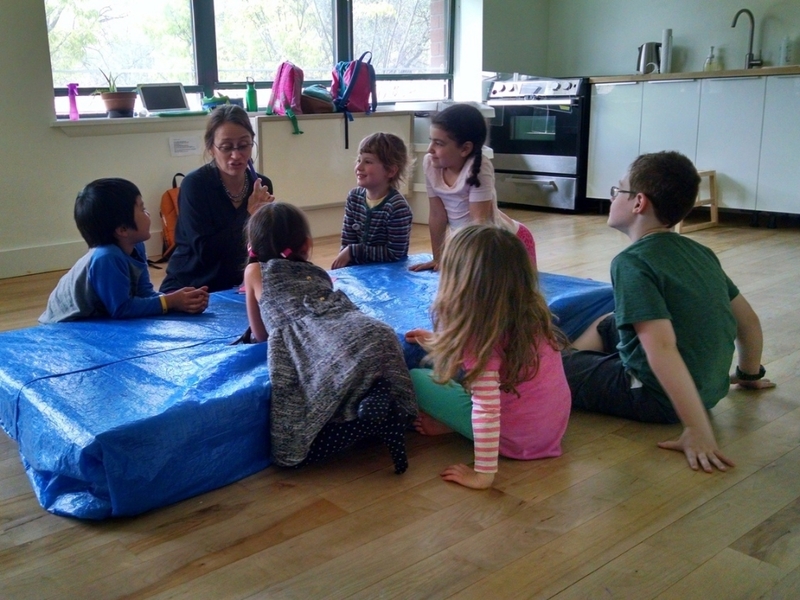 Monday afternoon, Amelia Lakoff came to lead everyone in a musical yoga class. Amelia played the ukulele and sang, “You Are My Sunshine” during the sun salutations and invited the Pono friends to lead their own sun salutes. Then the children transformed themselves into various creatures including monkeys, lions, and crocodiles. Amelia had a song for each one! Amelia had a song for each one! Thursday afternoon, returning teacher Jesús Mangual came to Pono to teach the children about woodworking. He’s not only a master woodcarver, but also an historian of Taíno culture (the indigenous culture of Puerto Rico). Everyone took a turn with the tools under his gentle guidance. When the piece is done, the Pono friends will be the proud owners of a wooden sculpture called a cemi. A cemi is an idol that the Taíno people would use to ask the gods for essentials such as food or rain. On Tuesday, math and sorbet were on the menu with Maysaa and the kids. Together, they whipped their way through understanding large numbers while calculating how strawberries, raspberries and cherries add up to something good enough to eat! Dr. A visited this week with news about the galaxy, Earth’s orbit and the Sun. The older Pono friends looked at pictures, enacted different planets in their own orbit and watched a simulation of Earth rotating around the Sun on the computer. Dr. A even composed a very silly song to memorialize the lesson. The littlest Pono friends learned about vegetables and fruits. After reading The Very Hungry Caterpillar and discussing all of the different foods important to a growing caterpillar, Dr. A got out different seeds. The children matched up seeds in envelopes with their respective seeds inside different fruits and vegetables. Armed with this new knowledge, the children were ready for a trip to the community garden! Poppy and Kate brought spades to the Pono plot, and the children planted cucumber seeds. Maybe we’ll have some Pono pickles this summer! We hopped on the Q train en route to Coney Island and the New York Aquarium on Wednesday for Hinako’s birthday field trip. After a cool jaunt to the coral reefs and giant tanks full of interesting fish, we ate lunch in the sunshine then headed to the beach. There was a lot of sand and shell collecting and for the very brave of heart (pretty much all of the children! ), a dipping of feet into the chilly Atlantic Ocean! The comic book is starting to come together, everyone. The characters have been sussed out so thoroughly that the emerging story is practically writing itself! Introducing: Honey Lime, Dr. Kale, Stone and Flame, from the imaginations of Sulaf, Jasper, Roly and Towa, respectively. We are all eagerly awaiting to see what takes shape with these great minds behind the project. This Saturday, May 9th, Pono will participate in the Self-Directed Learning Centers & Schools Panel at the Brooklyn School Alternatives Conference. The 45-minute panel will take place at 1:00 pm at the Old First Reformed Church, 126 7th Avenue, Brooklyn, NY‎ 11215. Later that afternoon, Peter Gray, author of Free to Learn, will give a presentation on free play and self-directed learning. For more information, visit: https://www.facebook.com/events/699631120160213/. Please spread the word!